The Bayside area supports a wide range of marine and land flora and fauna. Although many of the reserves have been previously cleared or altered our groups work hard to restore the natural environments. With five active Bushcare groups around the catchment there is always something happening. Check out the events with each group and contact us to become a volunteer. 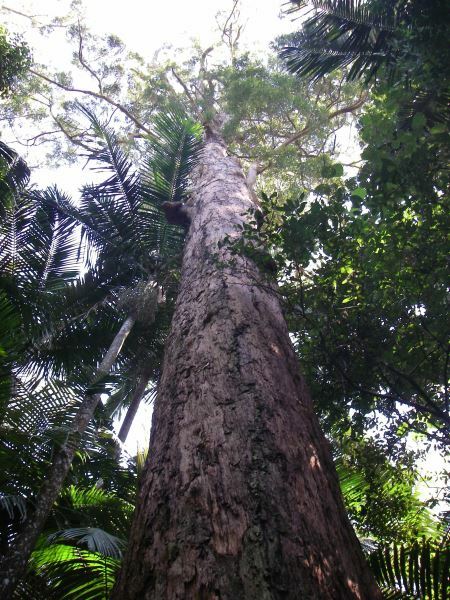 Our group operates in the Wynnum, Lota and Tingalpa catchments, which are unique and provide diverse habitats for flora and fauna. We aim to care and protect these catchments through our activities and events. Thank you for your help in our quest to continue to protect, conserve and advocate for our local Bayside environment. Also, fees are now due for members as well – please download the membership form and send to info@baysidecreeks.org.au. Members are very gratefully received and the small cost makes a big difference to our operations and feeling of success! Thank you to existing members and we hope to hear from you soon. 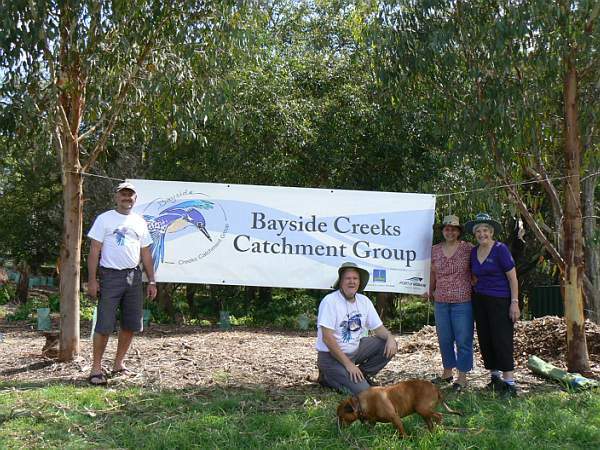 Bayside Creeks Catchment Group had two new group forming in 2018 and 2019! Interested volunteers are sought for both groups, email our Secretary Robyn on info@baysidecreeks.org.au for more information. 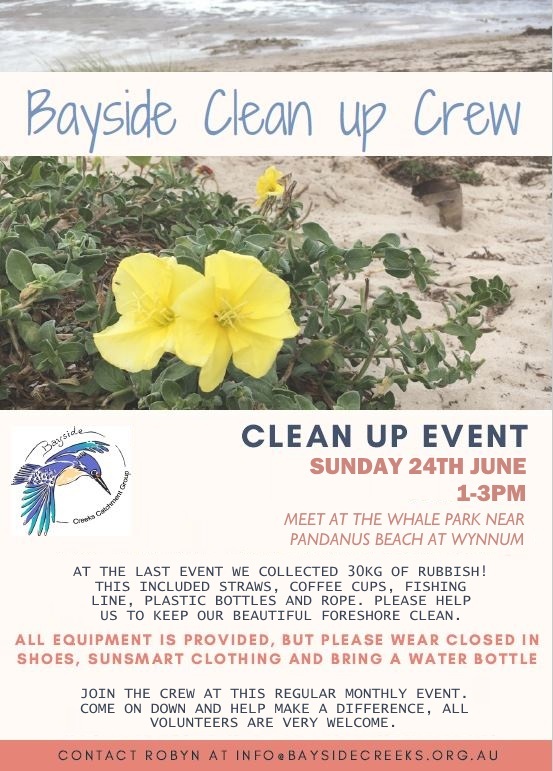 This new group meets monthly for a regular clean up down at Wynnum Esplanade. 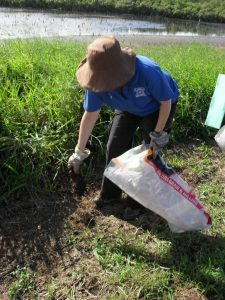 Each event involves a walk along the Esplanade to pick up rubbish to protect the beautiful and unique Moreton Bay. This is both a great way to meet new people and conserve our environment at the same time. Keep an eye on our facebook page for each monthly event as the time and location changes due to tide times. This new project run by Bayside Creeks Catchment Group supports volunteers in our community to grow native plants at home. Club members get a free home grown plants project kit, containing seed raising mix, vermiculite, trays and seeds. We share tips, successes and failures and hold regular events visiting our nurseries and collecting seed. 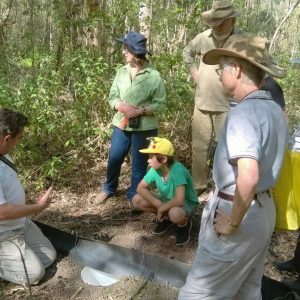 The Bayside Creeks Catchments Group (formerly the Bayside Environmental Network) have been restoring the health of the Wynnum, Lota and Lower Tingalpa Creeks and their catchments since 1991. We strive to maintain and restore the ecological integrity and high bio-diversity values of the creeks and their catchments. We also aim to build and share a knowledge and understanding of these valuable ecosystems through community engagement, education, awareness and support. Providing opportunities for local businesses to get involved through corporate volunteering days and sponsoring sites. If you’d like to join us – we’d love to hear from you. To find out how you can get involved or learn more about our natural environment email us or phone: President Charlie Robinson 0400 404 929, Treasurer Ian Curtis, Project Manager Keith Brown 0414 869 688, Secretary Robyn Gulliver. Our committee meets on the 3rd Wednesday of every month. Councillor Peter Cummings kindly allows us the use of his office space and our meetings are held at his Wynnum/Manly Ward Office: 3a/212 Bay Terrace, Wynnum. Melaleuca working bee team meets every first Sunday of the month from 7.30-9.30am, followed by a relaxing morning tea. Enjoy these beautiful winter mornings in this lovely reserve. Meet at the shelter on Clifton Street at 7.30pm, contact Teresa on ourmelaleucabushcare@gmail.com for more information. Last Saturday of each month at Whites Road while the roadworks continue. Contact Keith on 3396 9504 for more information. Every third Sunday of each month. Meet at the scout hall on Wood Street from 7.30am onwards (change for September 16th to 8.30-10.30am). Contact Gayle on 0423 845237. Second Saturday of each month, nice and bright and early at 6.30am in Waverley. Contact Pat on 0402 717 380 for more information. 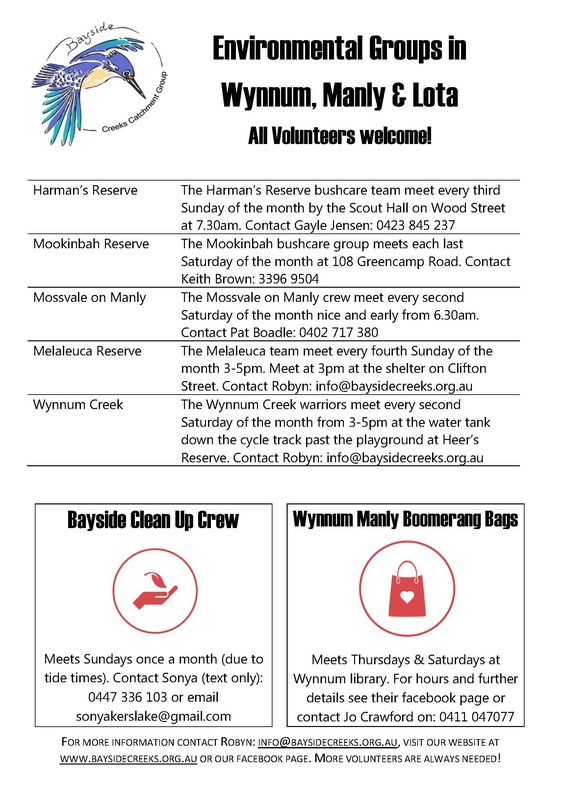 The Heer’s Reserve/Wynnum Creek bushcare group meet every 2nd Saturday of the month, from 3-5pm. We meet at the water tank at the end of the path from the playground at Heer’s Reserve. Contact Robyn on info@baysidecreeks.org.au for more details. Moreton Bay and its waterways provide quality of life, amenity and social harmony, with activities including fishing, swimming, boating, scenic appreciation, tourism and recreation. Most important of all are the ecosystem services provided by mother through the biodiversity of landscape and wildlife all around us. These environmental values support our lifestyles and livelihoods and make the Bayside a wonderful place to be. 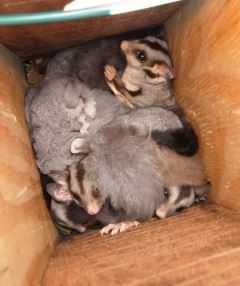 Unfortunately they are under threat through development, pollution and pest impacts. 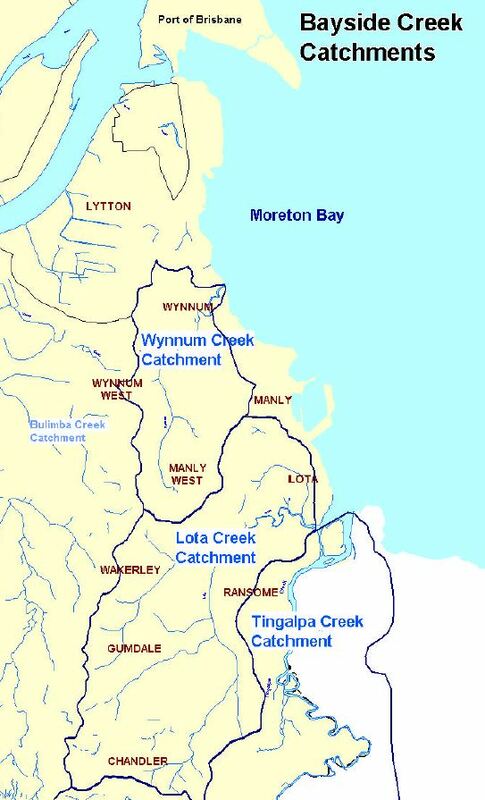 The Bayside catchments collectively cover an area of about 30 km2, in the Brisbane City local government boundary, with two major areas: Wynnum Creek Catchment and Lota/Lower Tingalpa Creek catchments. Our group formed out of the Bayside Environmental Network (BEN). This was first established in 1991, and renamed in 2006 in order to recognise the group’s focus on improving catchment and waterway health in the Wynnum, Lota and Lower Tingalpa Creek Catchments. We now help four active Bushcare groups and one emerging group in the area. We run various events such as clean ups and community planting days, and also assist other local groups with various environmental and community activities. We also apply, manage and acquit a number of funding grants that help conserve the reserve areas. We act as representatives for the Bushcare groups and advocate for conservation and the environment across the Bayside area. Bayside Creeks Catchment Group is very lucky to have the strong support of a number of funders, both past and present. In particular Brisbane City Council, through their establishment and management of the Bushcare project as well as through providing multiple funding grants have been crucial to our success. We have also received support from the Federal Government, Port of Brisbane, and many others. Thank you all tremendously! This website was proudly supported by Brisbane City Council with a Lord Mayor’s Community Sustainability and Environmental Grant. WHAT ARE THE BENEFITS OF A CATCHMENT GROUP? What happens in one part of a catchment affects the wellbeing of the rest of the catchment area. Resilient catchments mean better flood and natural disaster protection for our residential areas. Heavy rainfall can wash pollution and rubbish into rivers and across both our parks and reserves, and into the ocean. This can affect our neighbourhoods by polluting water, but also affect aquatic and ocean life. Our wellbeing depends on the myriad of flora and fauna that exist around us in our diverse and precious ecosystems. Healthy ecosystems provide habitat for our iconic Australian species like Koala and Bandicoots. 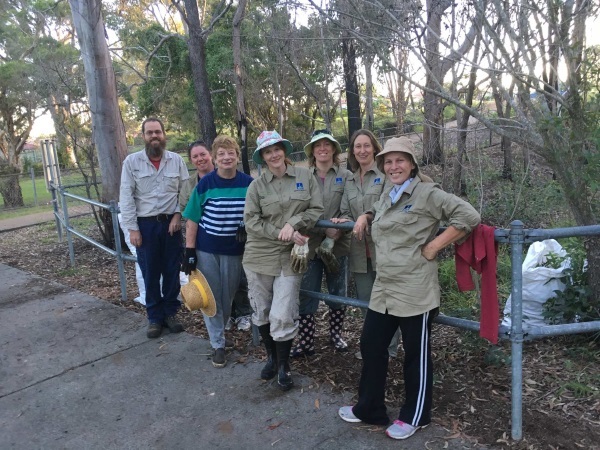 The Catchment Group assists and supports bushcare and other activities across the Wynnum/Manly/Lota area to not only improve our catchment health but also build a stronger and more cohesive community. Drop us a line at info@baysidecreeks.org.au anytime!